On February 16, 2017 at Digital Integration in Wealth Management 2017 conference and exhibition in London Metasite announced advance availability of Metasite Drupal for Financial Institutions, a distribution of the world’s most popular enterprise grade open source web content management platform tailored for the financial services industry. The announcement was made at the end of Mr. Kirvaitis’ talk ‘The Big Move to Open Source: discussion of pros and cons of an open source digital experience management platform in financial services’. Metasite Drupal for Financial Institutions distribution will include a set of thoroughly vetted 3rd party modules that Metasite considers essential for Drupal website operation by a financial institution – along with a number of custom modules built by Metasite. Access to the web content management platform’s full source code gives a financial services organisation freedom to decide when and how to develop and roll out new features and functionalities. Introduction of a new Drupal distribution specifically adapted to meet the demands of the financial services industry is a natural step for Metasite as it seeks to help global and regional financial institutions realise their digital visions and implement digital transformations in a safer and less costly manner. 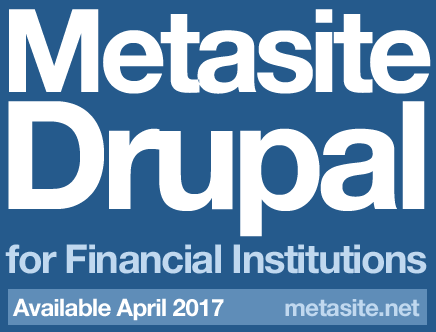 Metasite Drupal for Financial Institutions will be available in April 2017. If you would like to learn more about Metasite Drupal for Financial Institutions, please email hello@metasite.net or call +44 750 827 9430.